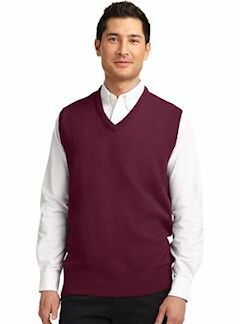 Custom embroidered sweaters, vneck sweaters, cardigans and vests for your corporate needs! Your embroidered logo is included in the prices below. Mens and womens styles for a casual or corporate professional look. Embroidered with your logo for any company funtion, expo or meeting. Ladies cardigan sweaters, vneck cardigan sweaters, mens sweater vests, mens vneck sweaters and cardigans. This workhorse of a sweater is made to layer. A low-pill finish and soft hand ensure you stay comfortable and professional-looking. 100% acrylic 1x1 rib knit v-neck, armholes and hem. Spandex in hem for shape retention. Custom embroidery included! Don't let the soft hand deceive you--this sweater is made for hard work. 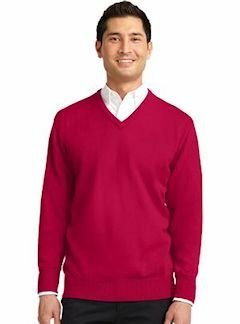 Available at a value price, this sweater has a low-pill finish and is a great uniforming choice. 100% acrylic. 1x1 rib knit v-neck, cuffs and hem. Spandex in cuffs and hem for shape retention. Custom embroidery included! 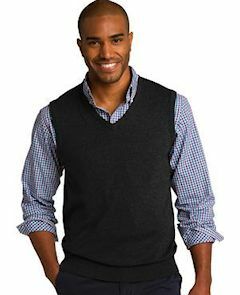 Span the divide between dressy and casual with this versatile v-neck sweater vest that pairs easily with slacks or jeans. 60/40 cotton/nylon. 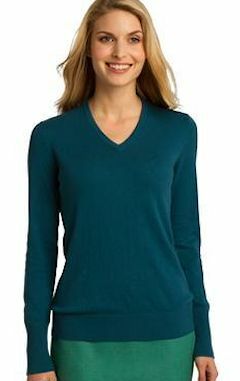 Rib knit v-neck, armholes and hem. Custom embroidery included! Custom embroidered Port Authority ® V-Neck Sweater. SW285 & LSW285 for women. Rib knit v-neck, cuffs and hem. Custom embroidery included! We took the classic bomber jacket style and reimagined it as a mixed fabric cardigan. 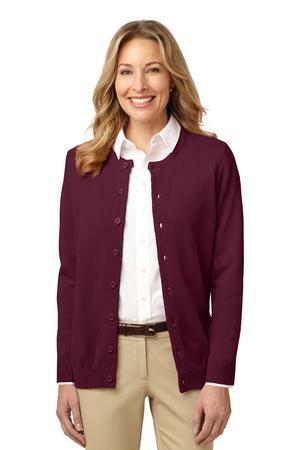 Custom embroidered Port Authority ® Value V-Neck Cardigan with Pockets. SW302 & LSW304 for women. 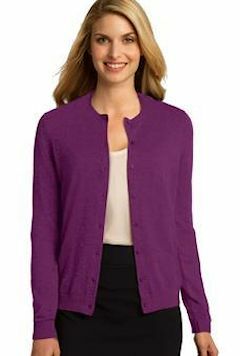 Two pockets to hold work essentials make this extra-tough (yet soft) cardigan even more useful on the job. 100% acrylic. Low-pill finish. 5-button cardigan placket with dyed-to-match buttons. 1x1 rib knit placket, cuffs, pockets and hem. Spandex in pocket welts and hem for shape retention. Custom embroidery included! **Ladies style: Deduct $4.00 each from pricing below for Ladies Cardigan. 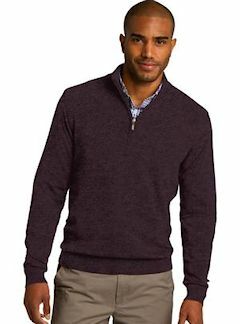 With rib knit details, this fine-gauge layerable sweater is just right for a day in the office or night out. Fully-fashioned sleeves add durability and ease of motion. 60/40 cotton/nylon. 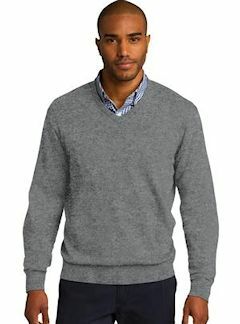 Rib knit collar, shoulders, cuffs and hem. Custom embroidery included! A working woman's dream: a button-front cardigan that adds soft polish, yet washes and wears beautifully. 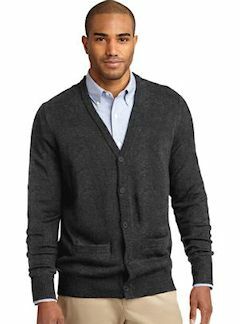 This stylish cardigan easily layers over a polo or woven shirt and has fully-fashioned sleeves for long-lasting wear. 60/40 cotton/nylon. 8-button cardigan placket with dyed-to-match buttons. Delicate rib. Custom embroidery included!